After some early week loses, crude prices are trading higher this morning following a volatile day of trading. Prices jumped to a high of $61.97 before falling by $1.70 within an hour during yesterday’s trading session. Tuesday’s early morning rally coincided with the announcement that President Trump intends to replace Rex Tillerson, former Secretary of State, with the current CIA Director Mike Pompeo. However, prices moved lower as equity trades weakened, erasing most of the early morning gains. This morning, crude prices have gained 50 cents to trade at $61.21, supported by a constructive API report and uncertainty in the market about Mike Pompeo’s stance on the Iran nuclear deal. Read the article below to learn how Rex Tillerson’s firing adds risk to the premium market. Refined products are also moving higher today, supported by inventory draws reported by the API yesterday. Diesel made small gains yesterday, and kept that momentum into this morning. 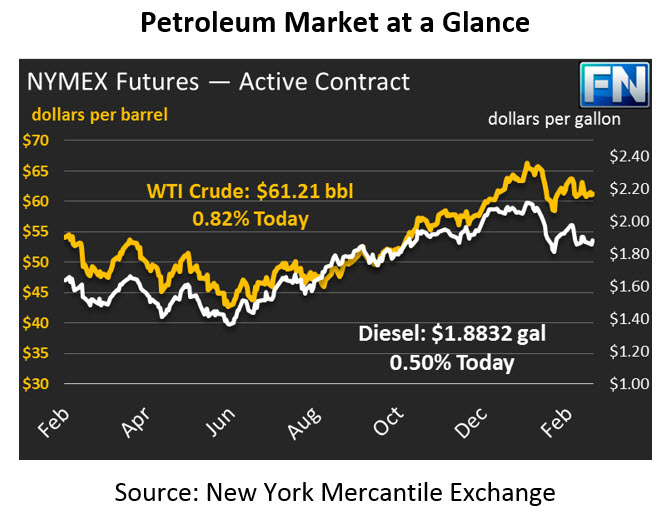 Today, diesel has gained 93 points (.50%) and is currently trading at $1.8832. Gasoline, lost over a penny on Tuesday, but has recouped those loses and more this morning. Prices have gained 1.46 (.77%) cents to currently trade at $1.9009. Yesterday’s API report was mixed for the oil complex. Crude posted a build of 1.2MMbbls, just under the market’s expectations of a 2.0MMbbls build. Gasoline was in-line with the market estimate, drawing by 1.3MMbbls. Diesel inventories drew by 4.3MMbbls, greatly exceeding the expectations of 1.2MMbbls. The market is trading firmly ahead of this morning’s EIA data.